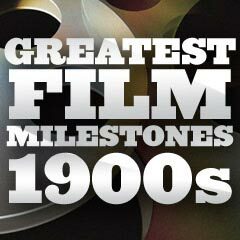 1904 Narrative film began to become the dominant and more popular form of film-making production. "Story films," although more expensive to make than actualities (daily life scenes), or documentary-like records of news events, were being produced in greater numbers. 1904 Biograph's short comedy The Escaped Lunatic (1904) told about an imprisoned lunatic who believed himself to be Napoleon. After breaking out from his cell, the remainder of the film was a chase sequence - it was one of the first American films to be structured around the chase. The film ended with the lunatic tiring of his pursuit and returning to his cell. 1904 Biograph's short (fictional) "story" film The Moonshiner (1904), a documentary-like copyrighted film about primitive life among whiskey-making mountain hillbillies, liberally used narrative titles (called "intertitles"). In the last scene titled "The Law Vindicated," a lawman was shot in the back by the moonshiner's wife. It was a big hit in the early nickelodeon trade. 1904 Biograph's Personal (1904) combined two plot lines: personal ads and a comedic chase, involving a recently-arrived young French gentleman whose advertised request for a wife became overwhelming. After many females responded at the assigned meeting place of Grant's Tomb in NYC, a chase ensued after him. To duplicate its success, it was remade by the Edison Manufacturing Company as How a French Nobleman Got a Wife Through the New York Herald Personal Columns (1904). 1904 Georges Méliès released the first two-reel film, The Impossible Voyage (aka Le Voyage a Travers L'Impossible) (1904) - at about 20 minutes in length, it was about four or five times longer than the average film at the time. 1904 Marcus Loew founded Loew's Theatres - it would eventually become the longest-lived theater chain in America. 1904 The first film exchange (or distribution company) in the US, the Duquesne Amusement Supply Company, was founded in Pittsburgh, PA by Harry, Albert, Sam and Jack Warner for the distribution of films -- it was the precursor to Warner Bros. Pictures. (Some sources claimed it was formed in 1907). 1904 The first ever remake of another film was Siegmund Lubin's western short The Great Train Robbery (1904) - a ripped-off remake of The Great Train Robbery (1903).